March 21, 2019 - The tournament has begun! Good luck with the pool everyone! Well, with UCLA and USC doing well in the Pac 12 tournament, they should be in. But they will be joined by local Cal State Fullerton who beat the other local team, UC Irvine, in the Big West Tournament Final to make the tourney for the 3rd time and first time since 2008. With the brackets coming out tomorrow, expect our website to be up very late Sunday or early Monday. As usual, all the rules remain the same ($10/entry, max 3 entries, deadline 9 am PDT Thursday). Spread the word to your friends and family and let’s see if we can top the 178 entries we got last year. Feel free to follow us on Twitter or Facebook. CERRITOS APT (smt)- No single play to discuss today (i.e., no dumb foul, no dumb flagrant-1, no dumb technical), just pure basketball drama. #1S-UNC and #3MW-Oregon went on a doughnut run with the Tar Heels rallying from 5 down with 2:56 left to score the last 12 points and the Ducks rallying from 4 down with 2:01 left to score the last 7 points to knock off hopefuls #8S-Arkansas and #11MW-Rhode Island, respectively. Other teams turned it on as well with #3S-UCLA down by one finishing the game on a 33-20 run in the last 13:32, #7MW-Michigan down by two finishing the game on a 24-18 run in the last 9:16, #1MW-Kansas up by one finishing the game on a 36-17 run in the last 12:00, #3E-Baylor down two finishing the game on a 17-11 run in the last 4:42 (a sequence that began with Manu Lecomte scoring 8 points in 45 seconds), and #8E-South Carolina down two finishing on a 42-33 run in the last 12:03. #2S-Kentucky narrowly won the ’14 rematch vs. #10S-Wichita St taking a tie game with 12:15 left and holding on to a three-point win thanks to two gutsy blocks on the final two Shocker possessions. On the last one, it looked like the Wichita St. player could’ve leaned in to draw a foul on the three-point shot but didn’t. Comeback kids #11E-USC never trailed by their magic number of 10 (just 9) and took the lead with under 5 minutes to go but couldn’t hold on against Baylor. #11MW-Rhode Island played well but scored just 26 points in the second half allowing Oregon to rally. Playing in their home state, South Carolina scored 65 points in the second half against #2E-Duke. CERRITOS APT/CYPRESS, CA (smt)- If not for the 11 seeds, the tournament has produced very few surprises, and even some of the 11s were not surprises to our pool participants. For the second time in the tourney and 13th time overall, #11E-USC rallied from a double-digit deficit to win, stunning #6E-SMU. SMU led 53-43 before losing 66-65 missing a last second buzzer-beating floater. 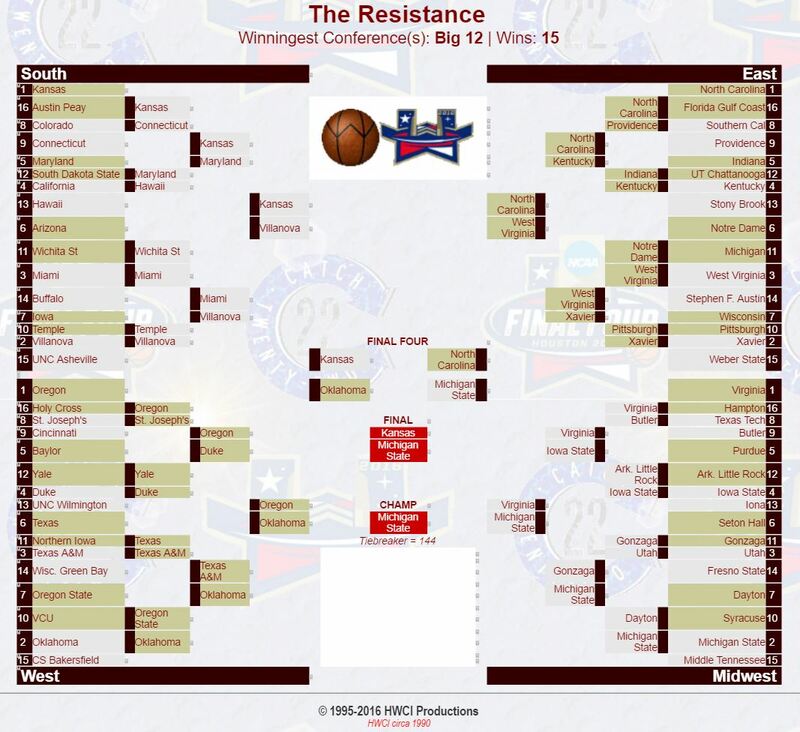 #11MW-Rhode Island won making it 3-for-3 for the 11 seeds but #6S-Cincy prevented the sweep beating #11S-Kansas St. #10S-Wichita St, by far the most popular upset pick, struggled but won as did #9MW-Michigan St. #7MW-Michigan St squeaked by while #2S-Kentucky, #3S-UCLA, and #7E-South Carolina used late game spurts to prevent an upset. #3E-Baylor, #3MW-Oregon, #2MW-Louisville, #1S-UNC, #1MW-Kansas, and #2E-Duke advanced as well. Another so-called controversial ending as #9S-Seton Hall intentionally fouled #8S-Arkansas in the final with 18.3 seconds left except, the player pushed instead of trying for ball resulting in a flagrant-1 giving the Pirates two shots and the ball. While most of twitter and TNT host Casey Stern is a complete idiot, ignoring the experts repeatedly stating the trip was NOT part of call (it’s like those political pundits who only focus on a small part of the issue, not the real or big issue, just to make their point), if the player only TRIED for the ball (hit the arm), there is no issue here, even if the Arkansas player tripped and fell hard. He had plenty of time to adjust and didn’t. IMHO, this was worse than the intentional foul Vandy committed yesterday since it put Arkansas up two possessions with the ball while the former left a lot of time and still down by one basket. And as the experts also stated which idiot Stern continued to ignore, the reason the officials called the common foul is that they can change a common foul to a flagrant-1 but they CAN’T change a flagrant-1 to a common foul, so in a game this important, the refs wanted to make sure they got the call right. Air Fabone 23 kept on winning, eventually getting the first 30 games correct before South Carolina turned up the D and the O turning a close 3-point game into a 20-point blowout in the last ten minutes. The original records were the first 22 games (Buckeye Mike ’09) and 23 games in a row (The Flying Elvi ’15) (Edit to add: The Swami (4th-Tied, 58) also won the first 23 28 games). He also went 31-1 for the round breaking the previous reocrd of 30-2 shared by two and leads with 62 points. Sandit and King Kobra are second with 60 points. With most favorites winning, Quinnsanity (8th-T, 56) went a perfect 16-0 (was tied for 100th yesterday) with 7 others going 15-1. But three did go 9-7 and three are tied for last with 40 points. After 24 games, we have only four upsets, with three of them picked by at least 68 of 178 entries. 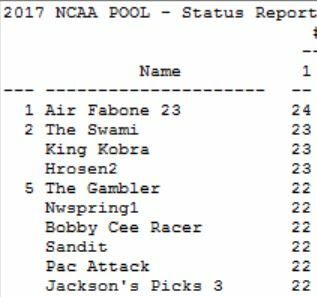 Given that, there is only one entry left on top, as Air Fabone 23 (Scott T) has set a record by winning the first 24 games. The Swami (Rick M) also set the record before Rhode Island’s win with 23 straight (previous was the first 22 wins by Buckeye Mike (Mike B) in 2009). The 24 straight wins broke The Flying Elvi‘s (Brian S) record of 23 straight during the First Round in 2015. Blind loyalty to his ala mater USC is the only reason he is still perfect. USC’s win also kept intact a First Four winner winning a 1st Round game for the 7th straight year. To root against or for him, his next 8 picks are: Kansas, Wichita St, Duke, Cincinnati, Michigan St, Kentucky, Marquette, and UCLA (so 3 upsets on deck). CERRITOS/LOS ALAMITOS, CA (smt)- The 12 seed is a favorite upset pick but last year, in a rarity, all four #12 seeds lost. This year, they are 2-for-3 as #12MW-Little Rock came back from 13 down with 3:19 left to win in 2 overtimes and #12W-Yale beat a top 25 team for the first time since 1952. Plus the Bulldogs did us a favor so we didn’t have to see those awful neon #5W-Baylor uniforms. I thought my daughter marked our TV with a highlighter. The 12s weren’t the only ones to come back with vengeance as the #9 seeds were shut out last year and are now 3-for-3 with #9MW-Butler, #9S-UConn, and #9E-Providence winning. The latter benefited from #8E-USC missing two front ends of a 1-and-1 and inexplicably allowing an open man under the basket with 3 seconds left for the game-winning shot. While #1E-UNC had only a one point lead at halftime, they pulled away in the second half and fellow 1 seeds MW-Virginia and S-Kansas (105 pts) had easy victories. #4W-Duke, #4MW-Iowa St, #3S-Miami, #5E-Indiana, #3MW-Utah, #11S-Wichita St (another First Four team who wins a 2nd game, 6th straight year), #11MW-Gonzaga, and #4E-Kentucky were challenged but pulled away. The Pac 12 imploded going 1-3 with only Utah winning (all 7 teams are top 8 seeds) while the ACC went 3-0. There were untimely technicals, airballed free throws, final drives where the driver lost the ball, and clutch shots. The Zags won for the eighth straight 1st round game despite not always getting a high seed. And we’ll get the rivalry game back, Indiana v Kentucky. VCU pulled away from USC to win the #11SW seed and maybe changed some minds as well (and for the Pac-10). I wonder how many updates I’ll get to picks? Long Beach St. (despite winning the Big West regular season title easily) may have been knocked out the tournament with its loss in the Big West final, but UC-Santa Barbara will replace them. In addition to UCSB, UCLA as expected made the tournament but also USC, who will play in the first-ever First Four first round (it’s not a play-in!). If we go further south, UC-San Diego San Diego St. got a #2 seed in the West giving the Southern California area four teams. Planning to get the initial email out later tonight and hopefully we’ll get the bracket up Monday morning. Where are all the west coast teams, especially the southwest? Maybe San Diego St. Maybe Arizona St. Maybe Santa Barbara. Maybe UNLV. St. Mary’s, Oakland, and Cal are in but they’re in northern California. For the first time since 2004, no USC or UCLA. How will that affect the number entries in our pool with no local team in it? Whoa… now I gotta pick them to make the 2nd round. There’s one loss in my bracket already. This is probably the final nail in Arizona’s coffin in extending their steak of 24 straight tourneys. That gives the Pac 10 5 teams in the tourney, which is already one too many. No room for ‘Zona to sneak in this time. Barring some extreme generosity by the selection committee, Arizona and Kentucky failing to make the tourney will only leave Kansas as the lone team to be in every bracket since our pool started in 1995. I see UCLA is following Pitt and UConn’s lead in losing early in the conference tourney in order to be rested for the REAL tournament. Unfortunately, it was to rival USC. Now, USC is just a win away from the tournament (and still has a slim shot even if they lose in the conference final to ASU). Yes, this pool will be very unpredictable. And Syracuse only needed ONE overtime tonight, and has played 115 minutes of bball in two days. Deadline is 9 am PDT Thursday.